Each year, Club Members receive an allotment of ClubPoints symbolic of the reservation rights of the vacation ownership interest(s) owned in the Club program. Members who own biennial weeks receive an annual allotment of ClubPoints every other year. The number of allotted ClubPoints is based upon the Home Week owned considering the particular resort, season and unit type owned. Assigned ClubPoints are automatically deposited into a Member’s account and utilized to make reservations in accordance with the rules herein. If a Member does not use allotted ClubPoints during a given year, they shall expire at the end of the year. On or before December 31 of the current year, Members may “save” any of the remaining ClubPoints from expiring by depositing these ClubPoints into the following year’s account. Saved Points may not be used to make Home Week reservations and may not be carried over beyond one (1) year. A fee applies to save points. Additional point saving options may be offered for previously saved ClubPoints. Convert ClubPoints or Bonus Points to Hilton Honors Points and use them for rewards options through the Hilton Honors loyalty program. All Members are automatically enrolled in the Hilton Honors program for the duration of their Club membership. If a Member sells or transfers their timeshare interest and their Club Membership terminates, any Hilton Honors privileges granted solely in connection with Club membership shall automatically expire. One upgraded Hilton Honors account may be established per Club Member account. Please refer to the Hilton Honors Program Terms and Conditions for further details governing the Hilton Honors program. Conversion for Immediate Use: On or before December 31 of the current year, Members may convert any number of their current year or next year’s allotment of ClubPoints into Hilton Honors points at the conversion ratio of 1 ClubPoint to 20 Hilton Honors points for a reservation at a Hilton branded hotel for immediate Hilton Honors Reservations. For example: 2,000 ClubPoints = 40,000 Hilton Honors points. 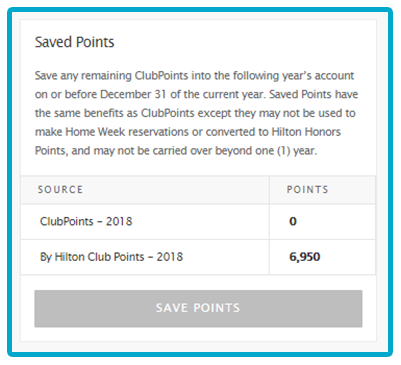 Conversion for Following Year Use: On or before December 31 of the current year, Members may convert any or all of the next year’s allotment of ClubPoints into Hilton Honors points at the current ratio of 1 ClubPoint to 25 Hilton Honors points. For example: 5,000 ClubPoints = 125,000 Hilton Honors points. The converted points will be deposited into the Member’s Hilton Honors account the first week of January of the following year. Members converting the entire annual allotment of Club Points attributable to their Home Week at West 57th Street by Hilton Club, The Residences by Hilton Club, The District by Hilton Club or owners of penthouse units at the Grand Waikikian by Hilton Grand Vacations Club and Grand Islander by Hilton Grand Vacations Club, receive an increased conversion rate of 1 to 50. Conversions for less than the entire allotment may be made at the standard rate of 1 to 25. 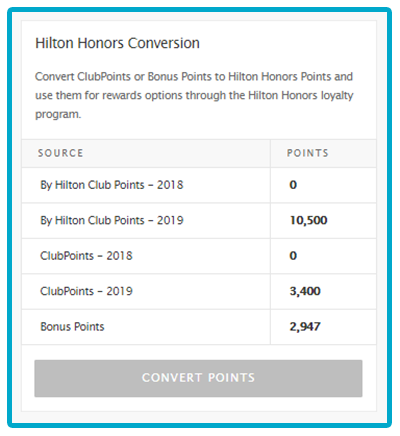 Bonus Points Conversion: Members may convert any or all of their Bonus Points (prior to their expiration date) to Hilton Honors points at a ratio of 1 Bonus Point to 25 Hilton Honors points. For example: 5,000 Bonus Points = 125,000 Hilton Honors points. The converted points will be deposited into the Member’s Hilton Honors account immediately upon conversion. 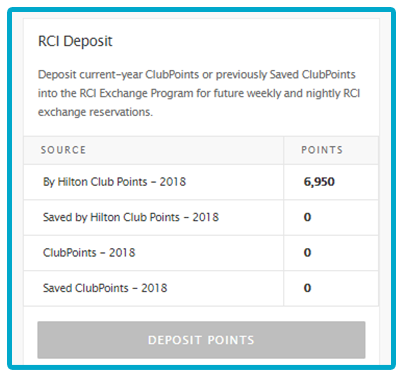 Deposit current-year ClubPoints or previously Saved ClubPoints into the RCI Exchange Program for future weekly and nightly RCI exchange reservations.  The RCI Exchange Program is an independent external exchange program operated by RCI, LLC and affiliated with the Club. Reservations through RCI may be made for weekly or nightly stays and are confirmed on a space available basis. Please refer to the chart of Point Values for RCI Exchange Reservations to determine the specific number of points required to confirm an RCI Exchange.